Meet your guide and group in central Milan and set out on a walking tour of the city. Start with a visit to the UNESCO-listed church of Santa Maria delle Grazie, a true masterpiece designed by the architect Bramante, and visit the Dominican convent where the world-renowned “The Last Supper” is displayed. Avoid the queues with skip-the-line entrance and enjoy a guided visit to the iconic mural painting, designed by the Italian genius of Renaissance art, Leonardo da Vinci. Take the time to admire the masterpiece up close as your guide points out details about the composition, the perspective effects, the use of colors, and much more. Just a few blocks away, continue your tour with a visit to the 16th-century church of San Maurizio al Monastero Maggiore, the “Sistine Chapel” of Milan, considered one of the finest yet little visited artistic jewels of the city. Here, disciples of Leonardo decorated the walls, the side chapels and the ceiling with colorful frescoes. 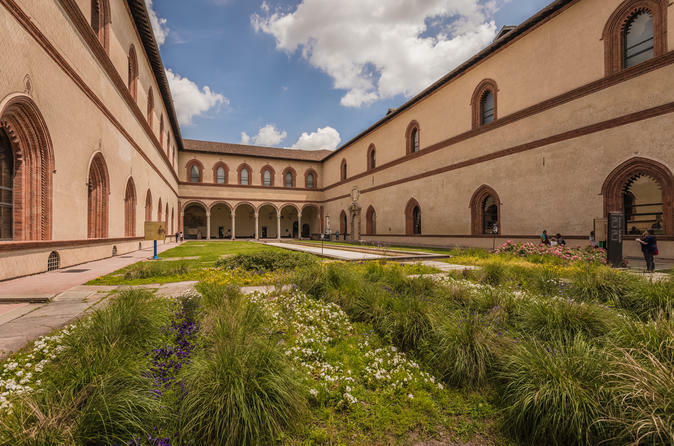 Finally, stop to admire the imposing Castello Sforzesco and stroll through the surrounding Sempione Park, as you learn more about the Sforza family, who once inhabited the royal fortress. Your tour ends in central Milan.